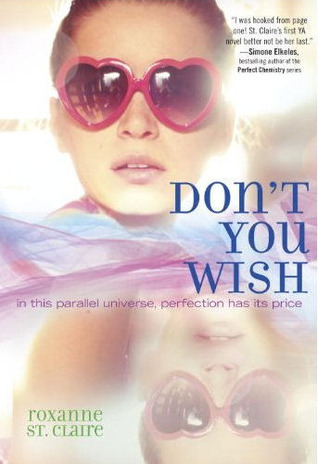 Don't You Wish by Roxanne St. Claire. Audience/Genre : Young Adult/High School, Parallel Universe, Romance. Publication : July 10th 2012 by Delacorte Books for Young Readers. The choice isn't as simple as you think. Annie is the everyday girl in high school - she's average looking, unpopular and a band geek. However, her dad's latest invention throws Annie into a whole new alternate universe where she is and has everything that she has ever wanted in life. This is the first book I've read that's by Roxanne St. Claire and it was such a happy read! First off, I adored Annie, she was..real. She didn't really get carried away despite being given the chance to have everything she wants and obviously, I loved that. Material things aren't enough to truly make someone happy and Annie could see past that despite having everything handed to her. Also, Charlie's instantly lovable. Really, this book had everything that I normally look for in a fun, enjoyable read. Sure, it's kind of cliche but that's what I liked about it. I could rely on it's predictability and knew for sure that I'd enjoy it. The parallel universe and the whole idea kind of reminded me of the movies 13 Going on 30 and 17 Again, in a really good way. This is a book that I'd definitely love to see made into a teen flick. Overall, Don't You Wish is a cute and enjoyable book; quick and perfect for some light reading.